2020 - 8 hunts already booked; 1st week fully booked now. The Black Bear population is estimated to be between 75,000 to 100,000 animals, one of the largest populations in North America. 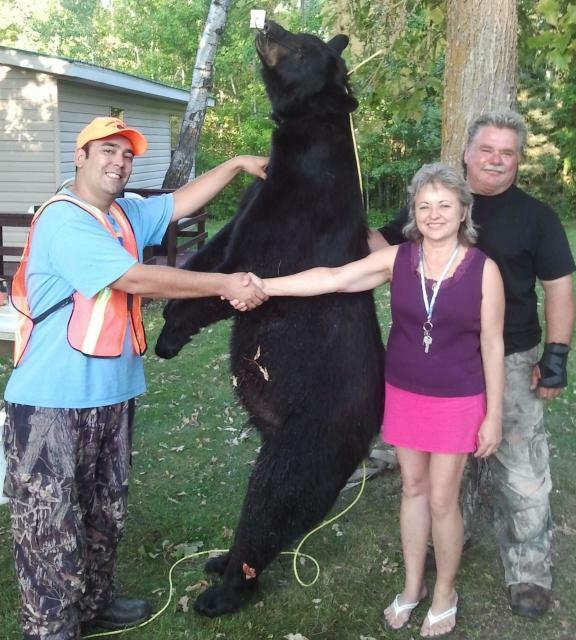 Northwestern Ontario is noted for its successful Black Bear Hunting experiences. The Natural Resources Biologists tell us that Black Bear migrate to our Resort's exclusive black bear hunting area in large numbers from other areas miles and miles away. Perhaps it’s the abundance of berries, fruit trees in the area, or acorns that fall from the many Oak trees on our properties that draw the bear here. It could be the large amount of vacated land with low pressure Black bear hunting here. Adult female Black Bear typically weigh between 130-230 pounds, while male Black Bears are between 200 and 400 pounds. Click here to view more bear hunting pictures. Trophy Black Bear weighed in at 650 lb dressed weight. Add at least another 50 - 70 lbs for live weight! 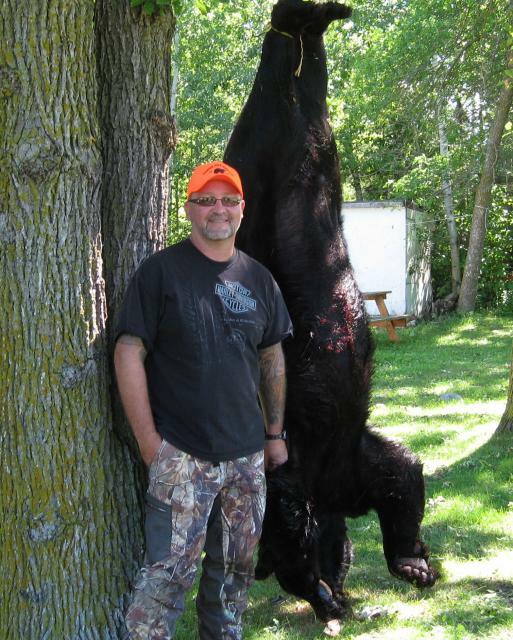 This is the largest black bear recorded in our large hunting area, a 650 lb dressed (already gutted) male Black Bear. 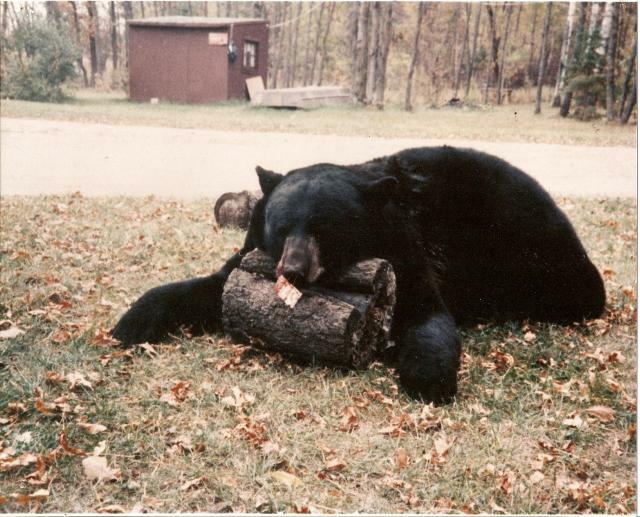 The Black Bear hunting opportunity is excellent at our Bear Hunting Resort. 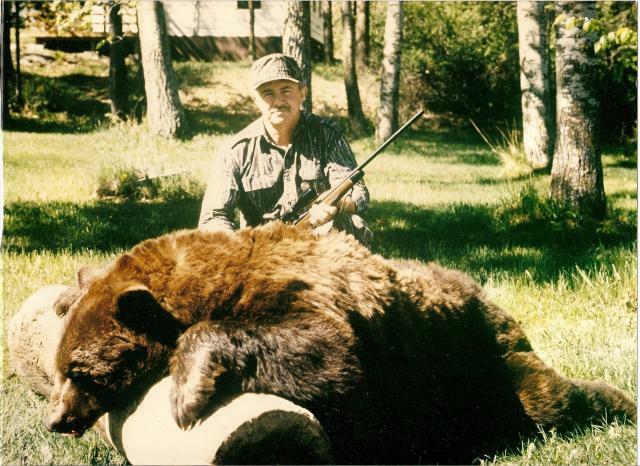 This camp was almost exclusively a black bear hunting camp that offered "World Class Black Bear Hunts", with success rates for Black Bear harvest always being high. This exclusive Black Bear Hunting Area is known to have a large bear population, with many bear of notable size and varying colors. 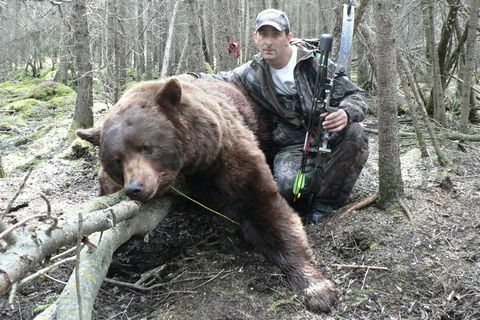 We provide baited bear hunting sites that ensure an excellent opportunity of success for all bear hunters. Our strategically placed bear stands are in carefully chosen spots within a good shooting range from our baits for Bow & Rifle- 12 yards to 50 yards; one field 100 yards. Our Black Bear baits are active and are producing an influx of black bear to the sites. Your bear guide will take you to find a site of preference for you and your mode of hunting. You may choose your firearm: Archery or Bow, Rifle, Muzzle Loader or Black Powder. 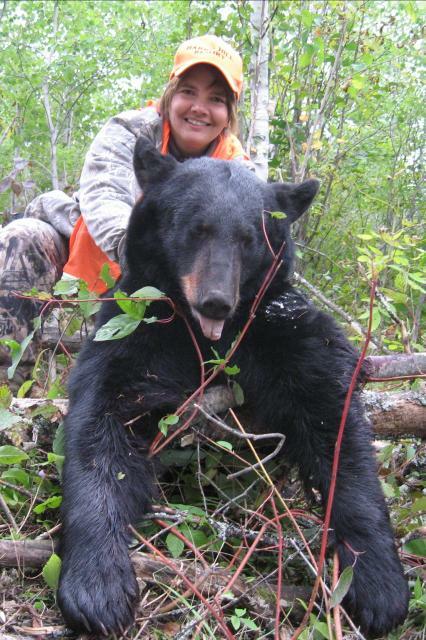 Whatever hunting site is chosen, an excellent opportunity awaits you to successfully harvest your trophy Black Bear. We have a large and exclusive Black Bear Hunting Area. No one else can hunt in it except our Black Bear Hunting Guests. your fully equipped house keeping cabinwith Wi-Fi, HD Satellite TV, Air Conditioning etc. There is an additional charge for the guide to skin your bear for you. We can help arrange professional processing and wrapping of your bear meat at a local butcher for you. A picture will be taken of you and your Trophy Bear that you can take back with you, or a picture mailed to you after professional developing. One Deluxe 18' Boat & 50 hp 4- stroke Motor for every 3 hunters is available for fishing or duck hunting. Meals- choose "all meals", "dinners/main meal" or "no meals"
Export Permits to take home your Black Bear are available here. On an "all Meals" Plan: Breakfast at 8:15, "Main Meal" at 2:30, Sandwiches & dessert "at Dark" usually 9-930pm. There is not a menu to choose from. On a 7 night stay, one dinner is steak; other meals might include Lasagna, Roast Chicken, Beef Roast, Ham, Pork Roast, Pork Ribs, Spaghetti, "fried" Chicken, etc. *with 3 subsequent Checks by arranged dates. We offer quality service, great hospitality, affordable rates and comfortable accommodations.